Every 4 rows need to be summed up and displayed against that group but every group has different number of rows, at the end of the group for the odd rows sum is different. For example, in the group if just one row is there then it will be value = X + last 3 rows value from the previous group similarly if 2 rows remaining for first row in the group will be X + last 3 rows value from the previous group for the 2nd row it will be from the previous group X + previous row from the group and last 2 rows value from the previous group at the end it should be total 4 rows. Result my query produces which is not what I am looking for. 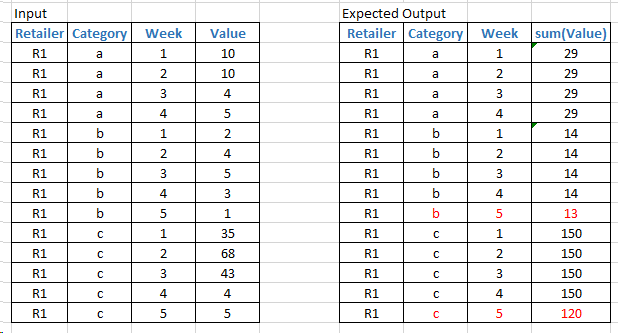 The last row in category b is adding up values from category C ,this is not what I want it has to be from Category b and in category C last two rows are incorrect Category C with Week4 should be 150 and with Week5 should be 120. How 13 and 120 are calculated: It's Category b Week 2 + 3 + 4 +5 values which is (4+5+3+1) and for category C its again the same thing Week 2 + 3 + 4 +5 values which is (68+43+4+5)=120 and if there was another row in Category b/c it should be Week 3+4+5+6 and so on there can be gap in the weeks but that doesn't matter it should just pick up the next week in the group but under same category. Let me try to explain again for category a we have 4 rows which is perfectly fine so the value is W1+2+3+4 = sum(10+10+4+5)=29 so against category I am adding one more column and that 29 will be displayed against all the weeks for category a similarly for category b and c I am adding up w1+2+3+4 =sum(2+4+5+3)=14 will be displayed against category b for first 4 rows now I am left with W5 for category b so W5 is calculated as current week(W5) + 3 Previous week) and that value should be displayed against Weeks 5 in category b. 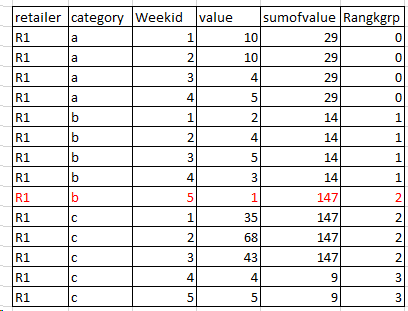 In the same category there are many other weeks ex : first partition has 88 weeks it's just calculating the values for first 4 rows then it starts adding up current - 3 previous weeks it shouldn't work that way ..it should be like 22 groups of 4 rows for each group value should be the sum of 4 rows where as if its 78 rows in the partition then 19 groups of 4 rows + 3 rows where it should perform for each row Current weeks + 3 preceding weeks and here I am not sure each partition might have odd or even number of weeks. Works in MySQL 8 and SQL Server (2012+). Not the answer you're looking for? Browse other questions tagged sql-server sql-server-2014 query or ask your own question. Under what circumstances can a division expression reduce the number of rows in a query's result? How Do I Filter a Group of Rows based on one Column's Value in TSQL?